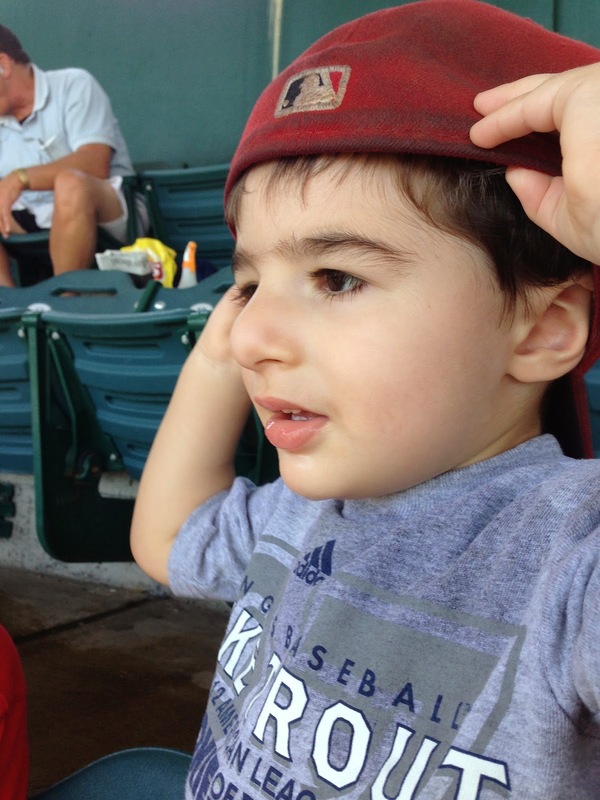 Chasin' Mason: Take Me Out to the Ballgame! 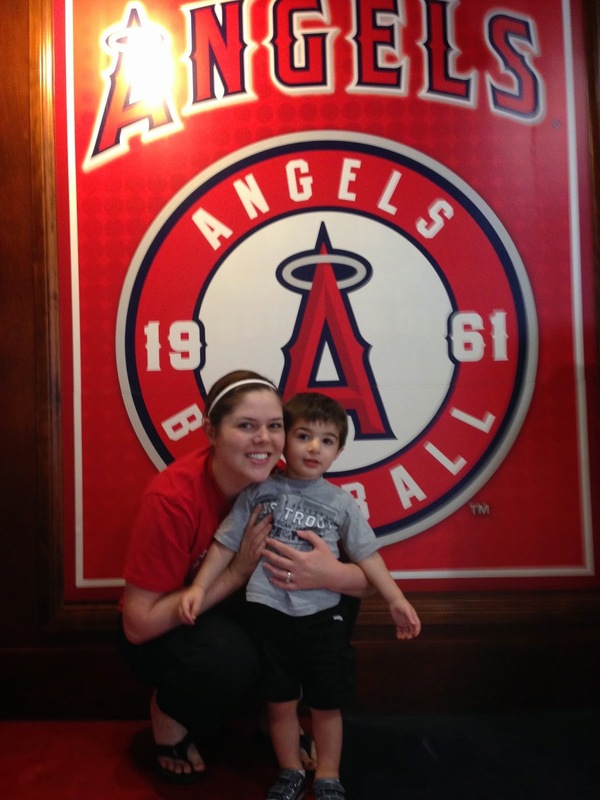 On Sunday, we went to our first baseball game of the season! Seth got some Costco Angels ticket packs from our brother-in-law, Scott, and sister-in-law, Lynda, for Christmas. We redeemed them in March but our first game wasn't until Sunday. We left a little early to pick up a sandwich for me at Subway and then got to the game just before it started. We stopped in the parking lot on the way in to take a picture. 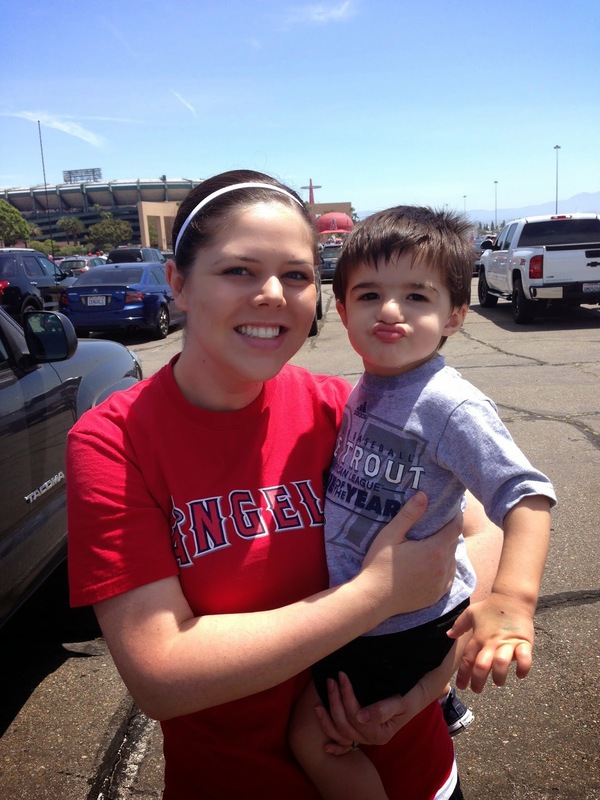 Clearly Mason prefers to make a duck face rather than smiling nicely. I was all excited about the good seats that Seth was able to get for us until we got there...to our 12:35pm game...on a 80 degree day...and realized that the seats were right in the sun. We went to sit down, I felt like I was sweating immediately, and I was worried about poor Mason getting burnt (even though we put sunscreen on him) so we abandoned our good seats and went for higher ground. I don't think it mattered to Mason since you know he wasn't paying attention anyway and Seth was just so happy to be there that he didn't care. Baseball stadiums make you realize just how out of shape you are. Especially when carrying a 25+ pound toddler up like 30 stairs to row M.
Once we regained our breath, we took in the sights, and enjoyed the game! We started by feeding Mason lunch. 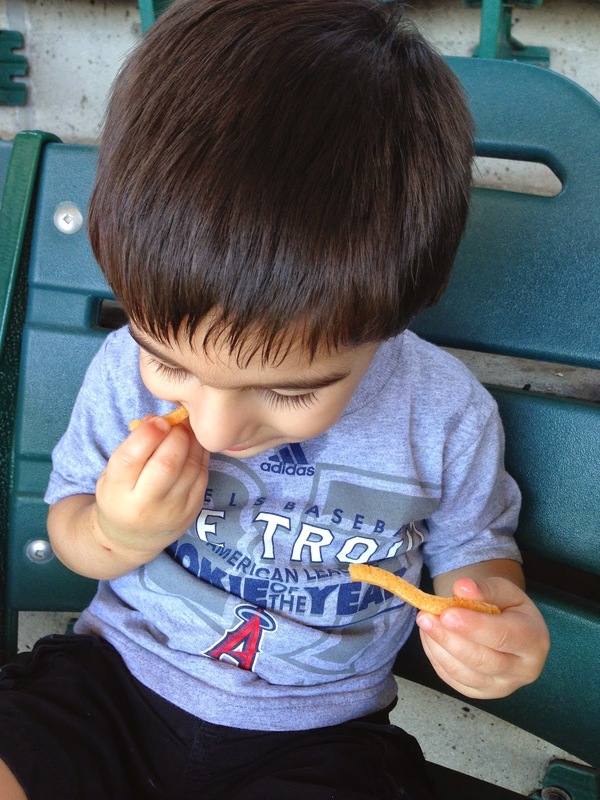 Seth made the mistake of giving him his veggie straws (the crunchy ones that are kinda like chips)... so he refused to eat any of the chicken that we brought for him. I was able to convince him to eat a few grapes, but barely. 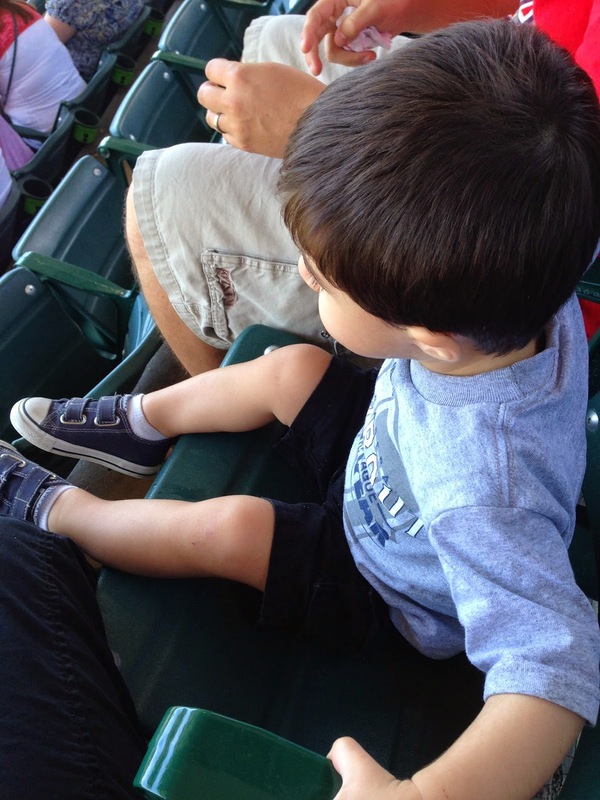 Luckily (at our new seats), there was nobody sitting next to us so we let Mason sit in his very own seat. He was having the BEST time. Seth had taken Mason to Gymboree earlier in the morning while I went grocery shopping, then we met up, got ready, and headed to the game. The 12:35pm game was right during nap time so we were worried about how well Mason would do. He did exceptionally well until he had had enough and then he crashed and slept on my shoulder for about an hour. 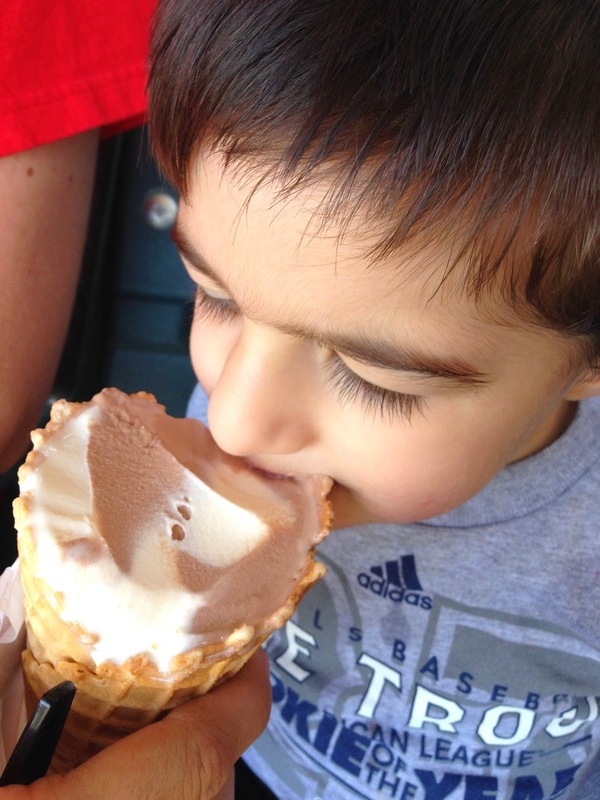 But when he woke up it was ice cream time! He was in HEAVEN. After ice cream, we decided that we should get going. Mason wasn't so into sitting still anymore and I had wanted to check out the store to see if we could get him a new shirt. So we let Mason walk around a bit and headed over to the store. 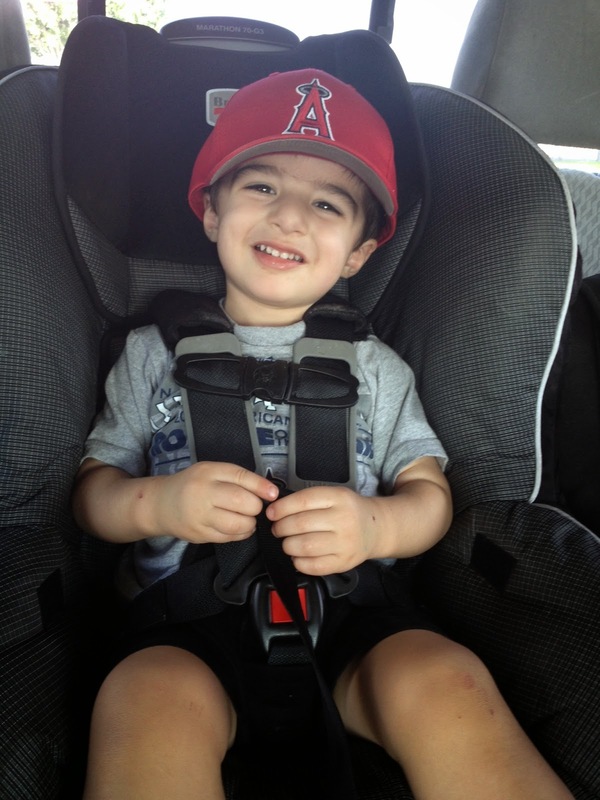 The Angels store has a pretty good selection and we were able to pick up some stuff for Mason at a pretty good price. I've been looking for a new shirt for me though and haven't found one that I like quite yet so I looked online when we got home. I had recently heard of the website Fanatics and I'm so glad I checked there. 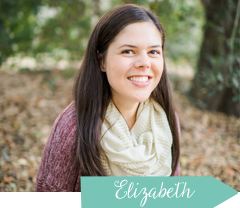 They are the leading online retailer of officially licensed team merchandise and have quite the selection of everything Angels. I found about 10 shirts that I liked and had the hardest time narrowing it down. Seriously, anything I could think of...they had it there! I might even be back to shop for some Father's Day gifts or even Christmas gifts for Seth and his Dad. Long story short, one hat and one shirt later, we were on our way home. My happy little baseball go-er. I love how happy he is to be at the baseball stadium. 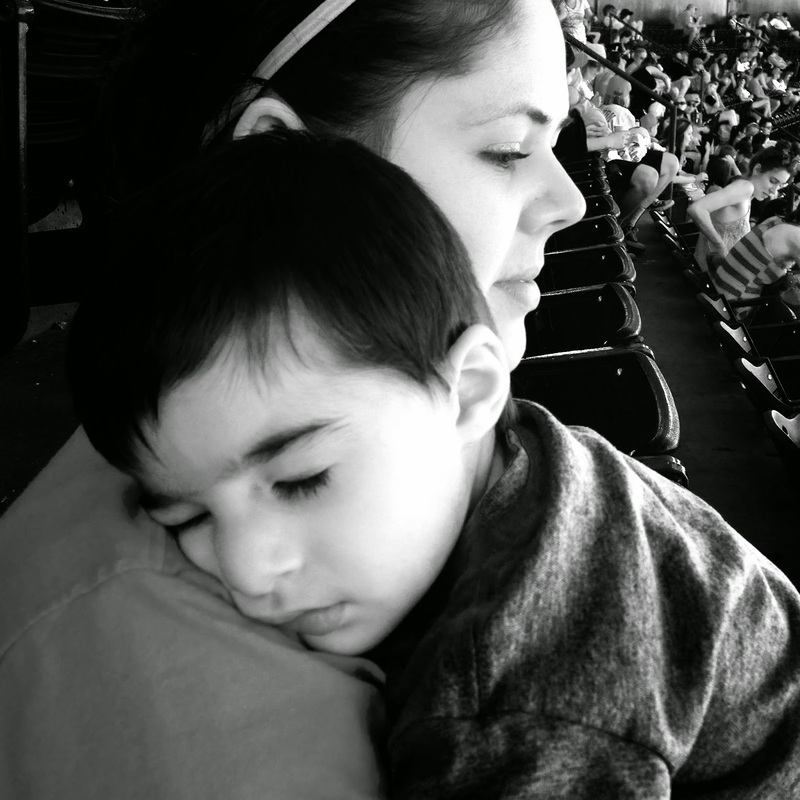 And I know Seth is over the moon at how excited Mason is when we say we are going to watch baseball. 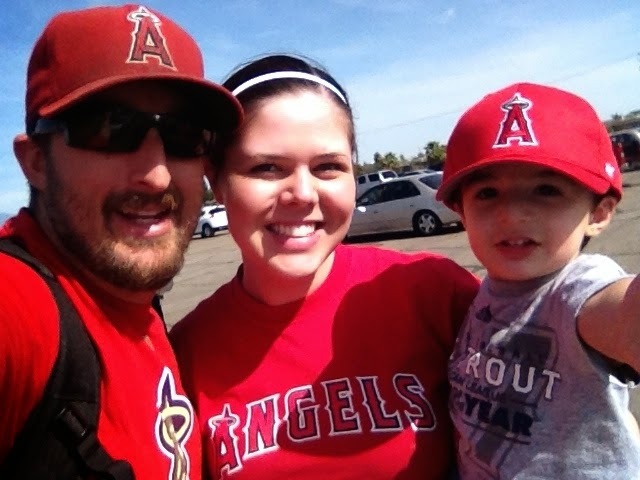 Though the Angels lost (BAD), I can't wait until our next game later this month (and to dress our family up in matching outfits again!). This was not a sponsored post by Fanatics. I was contacted by them but did not receive anything in exchange for this post. All opinions are my own. What a fun adventure! He did so awesome napping on you and working around nap time!!! I want to take Callie to another game soon -- she went as a baby but I think she'd have a lot more fun now! 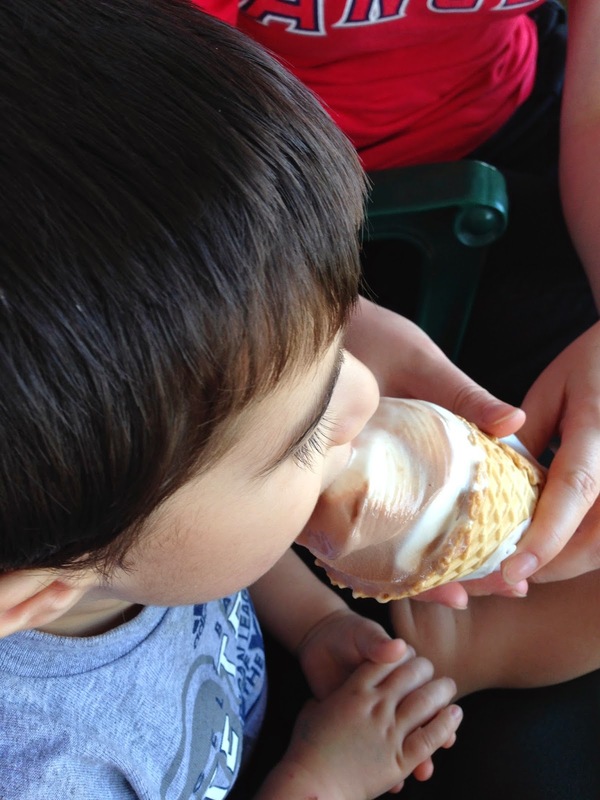 Probably very different than going to games pre-kids but still sounds like a lot of fun! I'd be happy too if I woke up from a nap and got ice cream! It's days like this one that make me LOVE being a boy mom. Little boys and baseball is like the best thig ever!! Awesome! What a fun day! I'm so impressed that he took a little power catnap! He is so stinking cute! 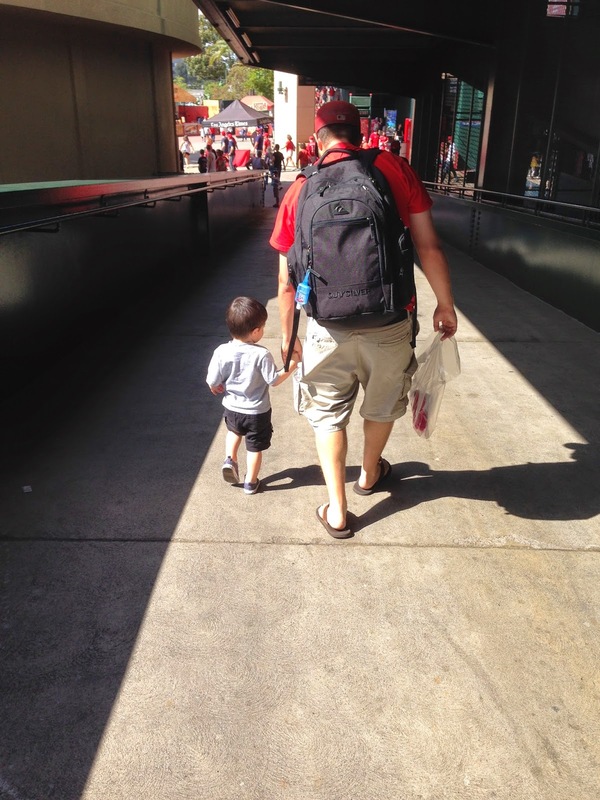 I can't wait to take Mac to a Cards game this summer. He went a few times last year, but I think he'll really enjoy it this year so much more. What a fun family day!! :) Adorable in his new hat. Sounds like such a fun day! 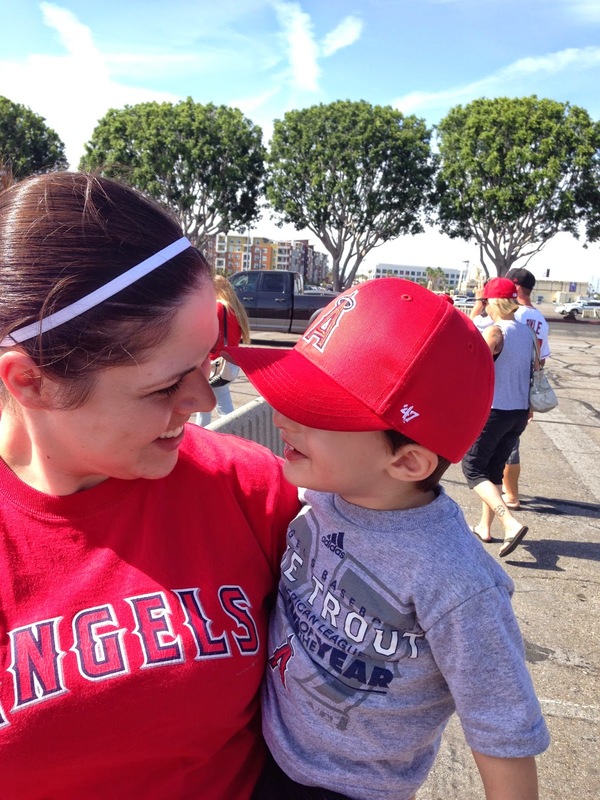 I absolutely cannot wait to take Liam to his 1st baseball game. It might have to wait until we move back to seattle (whenever that is) so that it can be a Mariner's game! My God the eyelashes on that kid! This is so fun! I really want to take Aria to a game, we went to a night game not too long ago and while baseball is duller than dirt in my opinion I think it would be much more fun to go with Aria. It is always very empty, so she could run around and have a whole row to herself. So cute that he just slept on your arm, I just can't see Aria doing that but perhaps. I'm starting to dread Disney tomorrow and her nap in the stroller. oy.